Tongue piercing in humans and the relative benefits of coffee and other caffeinated drinks might not be what you expect to hear in a veterinary training session. But it does memorably get the point across – in this instance when explaining why the best point to administer a stimulant to a new born calf is under the tongue. 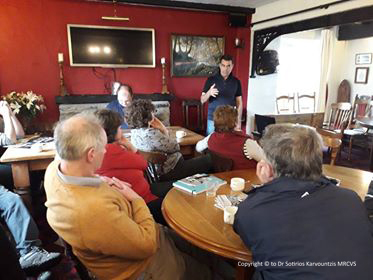 It’s this approach, combined with an easy going and jocular manner, that makes Mendip Vets sessions a popular choice. Farmers can be reluctant to take time away from the farm, but return home recognising that just one of Sotirios Karvountzis’ tips can save a life. 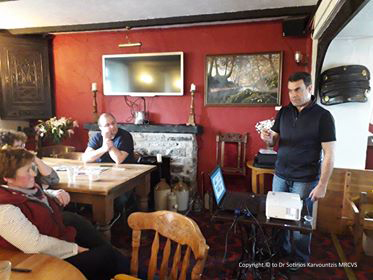 A recent course on Responsible and Safe Use of Veterinary Medicines delivered under Simply the Best Training demonstrated some new thinking, as well as explanations as to why some of the older traditions are counter-productive. It suddenly makes sense not to put a less than scrupulously clean hand down a struggling new born’s mouth, just at the time when it’s most ready to respond to antibodies in the colostrum, making it potentially fatally receptive to germs and bacteria. A reminder of the Five Freedoms is also a Win Win. It’s better for animals to be free of fear and distress, pain, injury and disease, hunger, thirst and discomfort and to be able to behave normally. It also brings economic benefit to the farmer, as well as enhanced job satisfaction. Sotirios endeavours to approach his clients on their own terms, greeting and bantering in Welsh where appropriate. And he’s keen to make his training and comments relevant to the experience and expectations of his audience. He explained: “Today was all about the best way to safely use veterinary medicines. It’s an everyday activity that we all take for granted, but very often if we don’t use medicines as per the guidelines the medicines are ineffective and also we end up using more than we need to. “Finally if we use them properly there is a huge financial incentive for the farmers in using less medicines, in reducing the use. They are not cheap and a bottle that costs £10 – over a year, the cost can rack up to £3000. “Some milk buyers now have gone a step further and have banned the use of specific products, usually the antibiotics that are commonly used in human medicine and the have forced farmers to change to alternative products. “It’s important to engage your audience. The worst thing that can happen is to end up preaching for two or three hours. It’s very important to first of all listen to what they are prepared to change in their habits and working practices. Huw Morgan, who milks 150 cows at Nantgaredig, near Carmarthen, said after the course that he would now be using fewer antibiotics. Sotirios had explained how to use alternative approaches, including painkillers. 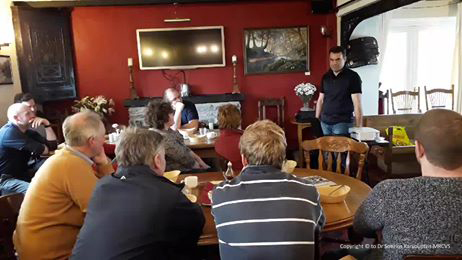 Robin Thomas of Llandeilo milks 900 cows in two units and said the session had taught him a lot about viruses. He praised Sotirios as ‘very, very good – he kept us awake’ and said he had learned quite a bit as a result. He added:”An important aspect was learning how to handle the temperature of medicines outside. It’s very important, especially with the hot summer we’ve had this year. I didn’t realise the hot weather would affect the drugs so much. “Hopefully we’ll be using fewer antibiotics as a result. All the milk companies seem to want it and that’s the way we’ve got to go. We’ve got to reduce them as much as we can – prevention is better than cure. Janet Watkins said she had learned quite a lot and it had been opportunity to refresh what she already knew, helping to keep her on her toes. She was impressed at the way he had fitted into the area and had even learned some Welsh. And on reduced use of antibiotics in her 350 cow herd, she said: “We have to, because of where we sell our milk. But it is something I believe in as a farmer. We shouldn’t be using antibiotics and if we can manage without them then we will. Dyfrig Davies praised the vet’s delivery and said he would be reviewing his worming regime as a result of the session. He had learned he could save money and time, as well as improve the welfare of his stock.